World History for Us All is a powerful, innovative model curriculum for teaching world history in middle and high schools. Print and online resources offer teachers a wealth of materials that present the human past as a single story rather than unconnected histories of many civilizations. Created through collaboration between K-12 teachers, collegiate instructors, and educational technology specialists, the World History for Us All (WHFUA) website is a free online resource that may be readily adapted to a variety of world history programs. It is a project of San Diego State University in cooperation with the National Center for History in the Schools at UCLA. Supplementing the website are two print publications: World History–The Big Eras, and A Compact History of Humankind. World History: The Big Eras brings together in a seamless world-scale narrative historical essays that appear in World History for Us All, the model curriculum for world history available on line at http://worldhistoryforusall.sdsu.edu. Published in workbook format, this slim volume will be a valuable companion to all educators who use the electronic resources of World History for Us All. It also stands alone as a brief history of humankind, inviting teachers, students, and all global educators to explore the past on big scales. World History: The Big Eras traces the human adventure from the time of our earliest bipedal ancestors to today, with new maps and additional documents to better guide your students through world history. This innovative contribution to the study of world history on a very large scale was authored by Edmund Burke III, Prof. of History at UC Santa Cruz; David Christian, Prof. of History at Macquarie University, Sydney, Australia; and Ross E. Dunn, Professor Emeritus of History at San Diego State University. 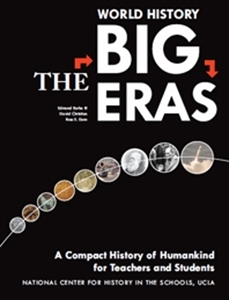 Suitable for Advanced Placement (AP) and regular history classes, The Big Eras is richly illustrated, includes a bibliography of further reading, and an index. 180 pages. Written by Burke, Christian, and Dunn. 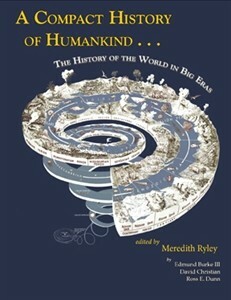 Order World History: the Big Eras from our online bookstore. Order A Compact History from our online bookstore.